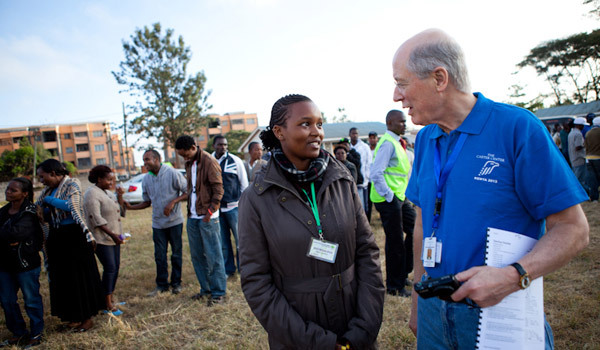 While observing on March 4, Dr. John Stremlau talks with Audrey Kasandi, deputy presiding officer at KIRDI polling station in Nairobi. "It's encouraging to see such a highly motivated young person actively participating in the electoral process," said Dr. Stremlau. 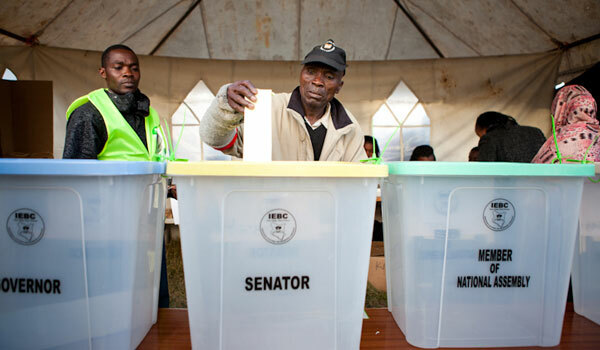 One of the first voters casts his ballots at KIRDI polling station in Nairobi. Kenyans voted yesterday to pick a new president, as well as senators, governors, members of parliament, and county representatives. 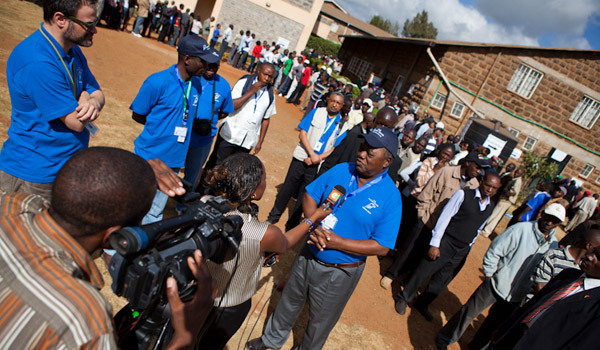 President Rupiah Banda speaks to a journalist at Precious Blood Riruta polling station in Nairobi on March 4. "We are not here to judge the outcome, but to judge the process that will lead to the outcome, as observers," President Banda later told Voice of America. 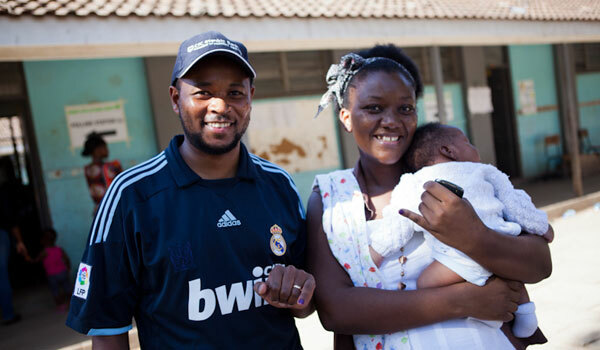 Fred and Lydia Gatere pose with their six-week-old son after voting at Milimani Primary School polling station in Nairobi. They were proud to have voted in the first election under Kenya's new constitution. 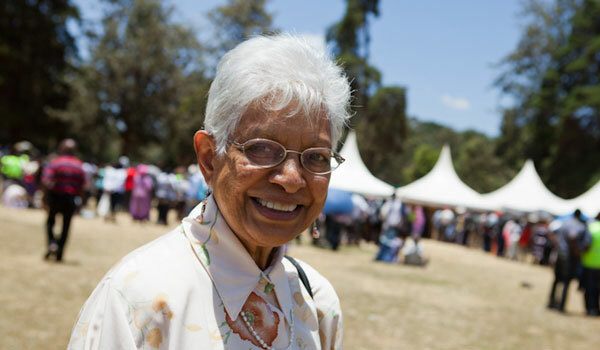 Asumpta Belinda Rego, a retired professor at the University of Nairobi, has voted at the same Nairobi polling station since Kenya gained independence in 1963. She has seen the demographics of those voting there change over time to become more diverse in race, age, and social economic background, which encourages her. 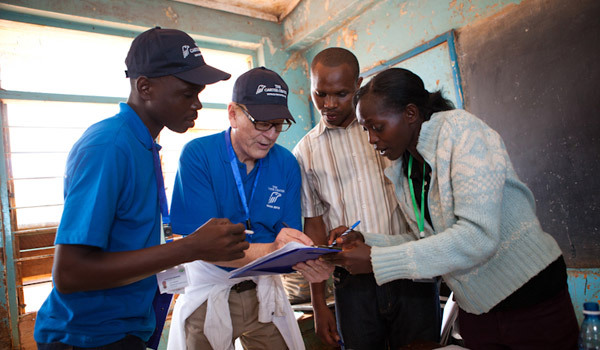 Carter Center observers Emile Codjo and Thomas Koenig confer with polling station officials at Mukarara Primary School in Nairobi. Carter Center short-term observers witness voting and counting in the days surrounding election day, but the Center's long-term observers have observed the electoral process since January. The Carter Center was the first international observation organization to deploy in Kenya. 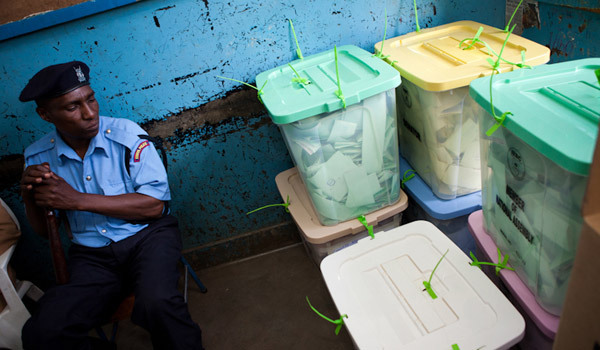 A police officer watches over sealed ballot boxes at Kilimani Primary School polling station in Nairobi following the close of polls on March 4. 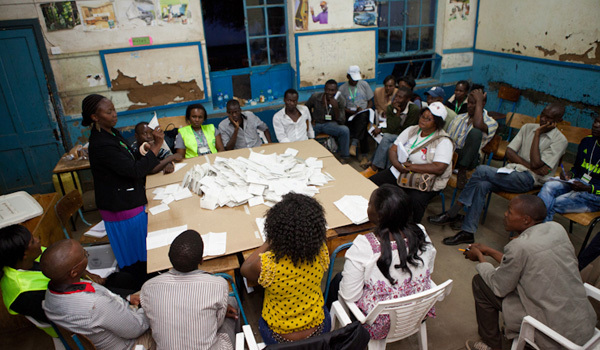 Presiding Officer Lillian Anyango displays a marked ballot during the vote counting process in the view of party agents and election observers at Kilimani Primary School polling station in Nairobi. 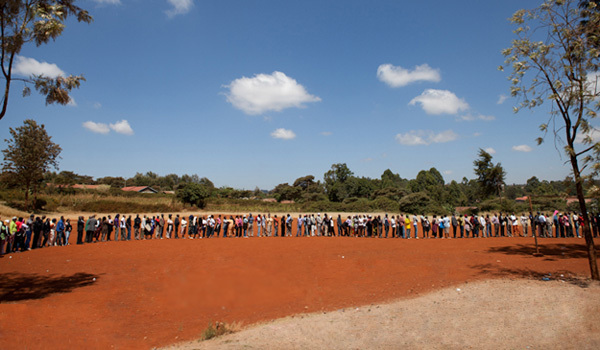 Carter Center election observers in Kenya reported longs lines outside many polling stations on March 4, some nearly a kilometer long, and voters waited in lines for up to six hours or more. "We were impressed by the turnout and the patience of voters who had been standing in the hot sun since 8:30 this morning in order to cast their votes at 3:30 p.m.," Carter Center Vice President for Peace Programs Dr. John Stremlau told PBS Newshour. "In all the elections I've monitored with The Carter Center, I haven't seen lines that long." Voting was generally orderly and peaceful throughout the day. Many voters were enthusiastic, and they also were eager to share their concerns and hopes with Carter Center observers. Fred and Lydia Gatere said they felt a sense of pride to have voted in the first election under Kenya's new constitution. Joseph Kariuki said he woke up at 3 a.m. after hearing his neighbors on their way to a polling station; he was impressed by people's commitment to vote. 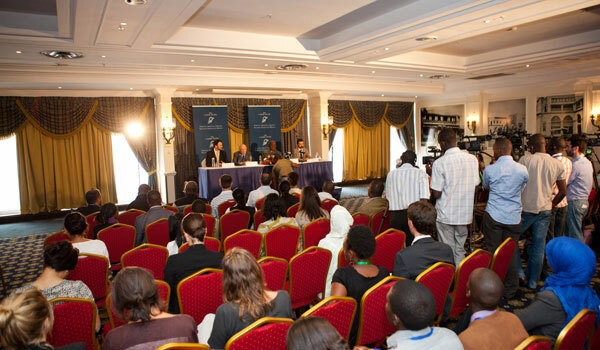 The Carter Center deployed a 60-person delegation from 29 countries to observe Kenya's election, led by former Zambia President Rupiah Banda and Dr. John Stremlau.